Department of Biosciences, School of Science and Engineering, Malaysia, University of Science and Technology (MUST) 12, Jalan PJU 5/5, Kota Damansara, 47810 Petaling Jaya, Selangor, Malaysia. ABSTRACT: Background: Cancer is still a dreadful disease, the treatment ranges with difficulties like strong side effects, shortage of donor and organs. In relation, plants and its chemical properties will provide an efficient source in the innocuous treatment for cancers. Objectives: To identify and isolate bioactive compounds from Gloriosa superba tubers and Albizia amara leaves with anti-cancer property that has traditionally been suggested as an anti-proliferative agent in ethnomedicine. Design: G. superba tubers and A. amara leaves are extracted and screened qualitatively. Extracts were then tested for antioxidant by DPPH assay. Highly potential extract with antioxidant are preceded to GCMS. The compounds determined from GCMS were selected according to its non-reported bioactive information on PubChem, and preceded against Hep-G2 and A431 cancer cell by MTT assay. Result: Ethanolic extract showed high antioxidant activity in both the plant extracts, GC-MS analysis was performed with ethanolic extracts revealing ample of phytoconstituent. 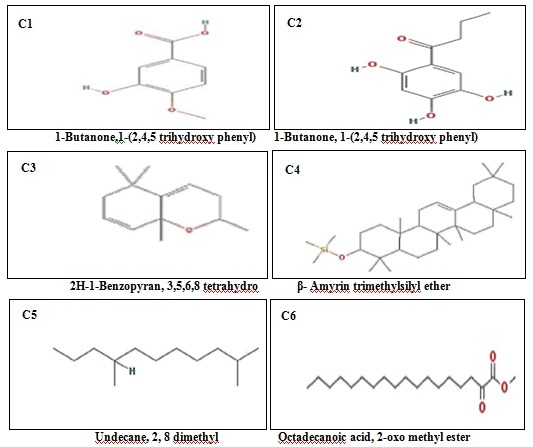 Six non-reported bioactive compounds were isolated and identified using GC-MS. MTT assay was performed using isolated compounds such as 3-Hydroxy-4-methoxymandelic acid, 1-Butanone,1-(2, 4, 5 trihydroxy phenyl), 2H-1-Benzopyran, 3, 5, 6, 8 tetrahydro, β-Amyrin trimethylsilyl ether, Undecane, 2, 8-dimethyl and Octadecanoic, 2-oxo methyl ester on Hep-G2 and A431 cell lines. The optimized use of these compounds reveals apoptotic growth inhibition of 50.58% in A431 cell line and 53.42% in Hep-G2 cell line. Conclusion: The anti-cancer property of G. superba tubers and A. amara leaves as mentioned in various ethnopharmacological records, concurrently emphasize the possible bioactive compounds to treat the hepatic and squamous skin carcinoma. INTRODUCTION: Cancer is detected by medical imaging or biopsy and it is often treated with help of radiation, surgery and chemotherapy 1. Many complementary treatments have been introduced and its use has improved dramatically around the World 2. People find that certain complementary methods are very useful to help control toxicity and improve the quality of their lives 3. Hepatocellular carcinoma is a common type of primary liver cancer, commonly caused by cirrhosis and skin cancer is a destructive malignant cancer growth on skin 4, 5. Chemo drug therapy were used to prevent the growth and metastasis of hepatic and skin cancers 6, but the recovery rate stays low as these synthetic drugs cause side effects and metabolic suppression 7. Many medicinal plants have used to treat the cancers and tumors in early days in Indian and Chinese tradition 8. Based on ethnomedicine surveys, Gloriosa superba and Albizia amara is used to treat liver and skin cancer 9, 10. Cancer growth is inhibited by the event of caspase-mediated cell death and it is also known as apoptosis 11. Apoptosis is a highly regulated traumatic cell death process caused by sudden cellular injury 12. The alternative products from plants provide us apoptotic induced cancer suppression with natural nontoxic metabolic activity 13. Gloriosa superba and Albizia amara are flowering plant and are rich in alkaloids and other essential compounds 14, 15. These plants been used in the traditional therapy for various ailments 16, 17 such as piles, ulcer, snake bite, acne, pimple, cancer, leprosy and also used as antibacterial, antifungal, astringent, antidiarrheal, anti-inflammatory, emetic and anti-cancer agent 18, 19. G. superba tubers and A. amara leaves possess bio-active compounds involves extrinsic apoptotic pathway in cell signalling by ligand binding on the death receptors 20. 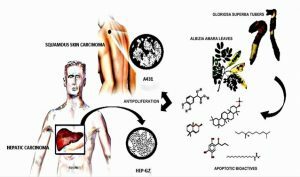 Compounds obtained from G. superba tubers and A. amara leaves were focused in this study, as antiproliferative agents to prevent cancer cell growth and metastasis by activating caspases mediated apoptosis in squamous skin carcinoma and hepatic carcinoma cell lines 21. MATERIALS AND METHODS: Albizia amara leaves and Gloriosa superba tubers were collected from Ariyalur district, India. The collected samples were shade dried and pulverized individually. Soxhlet apparatus was setup manually and the thimble was filled with 150 gm of powdered samples. Solvents like ethanol (ET), aqueous (AQ) and benzene (BE) were used in extraction process. The solvent extracts were collected and stored in a standard mehod 22. 1 gram of each extract was dissolved in 100 ml of respective solvents and used further. The preliminary screening of phytochemicals was carried out using procedures, commonly employed with precipitation and coloration reactions to identify the occurrence of major secondary metabolites. 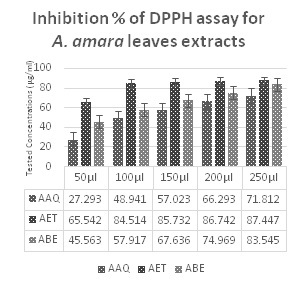 Antioxidant activity was determine for G. superba tubers (G) and A. amara leaves (A) extracts by DPPH assay 23, different concentration of 50 µl, 100 µl, 150 µl, 200 µl and 250 µl samples were used respectively. The sample concentrations were incubated with 3 ml of 0.1 mM DDPH for 30 minutes in dark. After incubation, the test concentrations were observed at 517 nm in triplicate values. The extracts with highest range of antioxidant activity on comparing with other solvent extracts were subjected to Gas chromatography Mass Spectrometry, GC-MS was carried out with Perkin Elmer Turbo Mass Spectrophotometer equipment’s. Perkin Elmer Elite - 5 capillary columns was used, measures about 30 m × 0.25 mm with the thickness of 0.25 mm film. The carrier gas Helium was used, with the flow rate of 0.5 ml/min. The sample injection volume was 1ml. At first, the ethanolic extract of two different plants were loaded and programmed as 110 °C for 4 min, increases to 280 °C. The total run time was 90 min for each sample. The outcome were analyzed and could able to identify a six non-reported compounds from the G. superba tubers sample and A. amara leaves sample in a specific range of retention timing (RT). PUB-CHEM library was used to identify the bioactivity of the components. Measurement of peak areas and data processing were carried out by Turbo-Mass OCPTVS-Demo SPL software. The selected compounds from the GC-MS analysis were separated particularly by flash chromatography and mixed together. The mixed samples were run again to confirm the presence of identified six non-reported compounds. 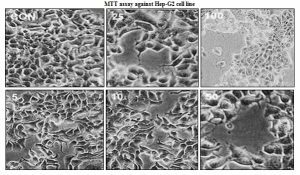 The apoptotic effect of collected sample from G. superba tubers and A. amara leaves on Hep-G2 and A431 cell lines were determined by the MTT cytotoxicity assay 25. Hep-G2 cell lines [HEPG2] (ATCC® HB-8065™) and A431 cell lines (ATCC® CRL-1555™) were purchased from ATCC, USA and the sub culturing method was followed according to ATCC procedures. Cell lines were incubated and after 48 hrs incubation, the cell reaches the confluence. Cells (1 × 105 / well) were plated in 1 ml of medium / well in 24 well plates along with samples of various concentrations 26. Then, the cells were incubated at 37 °C in the presence of various 5, 10, 25, 50 and 100 µg concentrations of bioactive isolates in 0.1% DMSO for 48 hrs. 200 μl (5 mg/ml) of 0.5% 3-(4, 5-dimethyl-2- thiazolyl)- 2, 5- diphenyl- tetrazolium bromide (MTT), phosphate-buffered saline solution was added to each well and incubated for 4 hrs. The viable cells were determined by the absorbance at 570 nm. Observances were recorded and the concentration required for 50% inhibition of viability (GI50) was determined graphically. DMSO was used as blank and the wells without sample containing cells were used as control. The effect of the samples on the proliferation of Hep-G2 was expressed as the % cell viability, using the standard formula. The results were expressed as Mean ± standard deviation (SD) and statistically compared with control group or within the groups using triplicate values. For every assay, data were evaluated for separate three independent experiments. 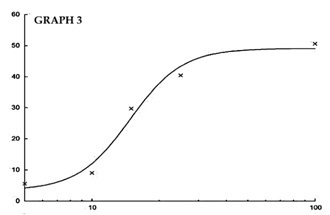 Dose-response curves were fitted using a nonlinear-regression sigmoidal dose-response curve model provided in the Graphpad Prism software (Graphpad software, Inc., San Diego, USA). 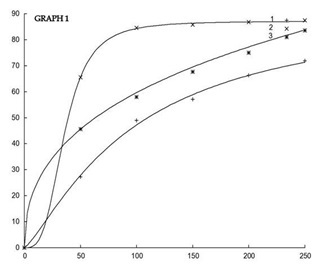 IC50 and GI50 values were derived from fitted curves for each single experiment. Finally IC - values were calculated as average of three independent experiments with the standard deviation of the mean values. Data from the different assays were statistically compared using one way ANOVA analysis with Tukey's test (n = 5) as post-ANOVA analysis (p < 0.05). RESULT: G. superba tubers and A. amara leaves were studied for the bioactives with antiproliferative potentiality. According to ethnomedicine survey, the leaves of A. amara and tubers of G. superba were focused in anticancer study. A. amara leaves and G. Superba tuber were extracted and qualitative occurrence of various phytochemical was performed by standard preliminary phytochemical screening procedure 27. Occurrence of various phytochemicals is mentioned in below Table 1. Further, each extract were analyzed for antioxidant test by DPPH antiscavenging assay. 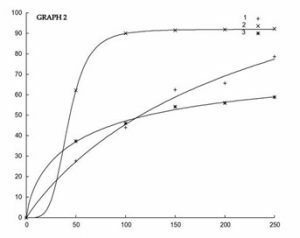 The inhibition percentage of A. amara leaves and G. superba tubers exhibits triplicate value of absorbance using UV-spectrophotometry at 517 nm for 50, 100, 150, 200 and 250 µl concentration from both plant solvent extract as mentioned in Table 2. 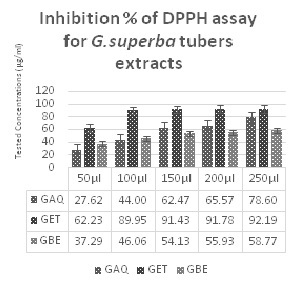 Values of DPPH assay was determined from standard sustained calculation using control value 1.341 ± 0.003 for A. amara leaves and 1.128 ± 0.001 for G. superba tubers. Among the three extract, AET (87.44 ± 0.172) and GET (92.19 ± 0.236) has the highest inhibition rate for 250 µl/ml. 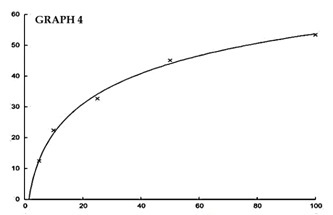 To understand the IC50 of antioxidant, one way ANOVA non-linear line regression curve was made using 3D-PRISM software as showed in Graph 1 and 2. The AET showed IC50 value of 35.666 ± 1.473µg/ml with hill coefficient of 12.690%, followed by ABE 49.850 ± 0.450 µg/ml with the hill coefficient of 47.260% and for AAQ 97.134 ± 1.271 µg/ml with the hill coefficient of 20.710%. 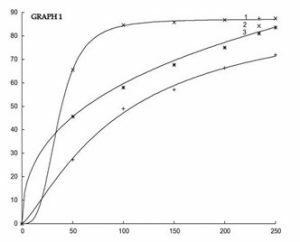 IC50 of GET as 42.161 ± 0.350 µg/ml with the hill coefficient of 48.850% followed by GBE of 59.710 ± 0.742 µg/ml with the hill coefficient of 44.850% and for GAQ 149.836 ± 0.954 µg/ml with the hill coefficient of 50.320%. From the higher indication of antioxidant activity in the AET and GET, GC-MS analysis was done to identify the specific bio-active agents which perform antioxidants. The ethanol extract of both the plants were carried out for GC-MS and ample of compounds were obtained in TIC chromatogram. In a specific RT, the compounds were separated and collected. The bioactivity of the compounds was determined from the molecular database of PubChem. The non-reported compounds were chosen to perform anticancer assay as mentioned in Table 3. Six compounds such as 3-Hydroxy-4-methoxy-mandelic acid (C1), 1-Butanone,1-(2,4,5 trihydroxy phenyl) (C2), 2H-1-Benzopyran, 3,5,6,8 tetrahydro (C3), β-Amyrin trimethylsilyl ether (C4), Undecane, 2, 8-dimethyl (C5) and Octadecanoic, 2-oxo methyl ester (C6) from ethanolic extract of both plant samples was isolated and obtained from collecting tube. 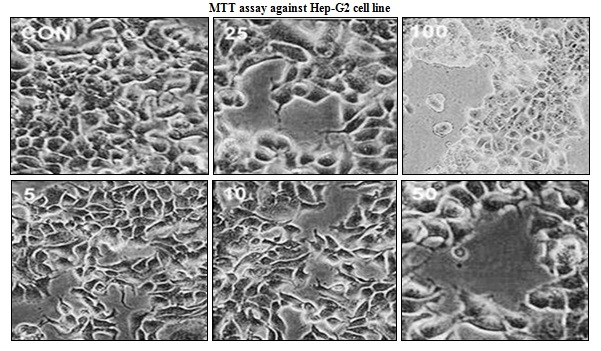 MTT assay on Hepatic Carcinoma (Hep-G2) and Squamous Skin Carcinoma (A431) cell line was performed using C1, C2, C3, C4, C5 and C6 compounds as shown in Fig. 2. 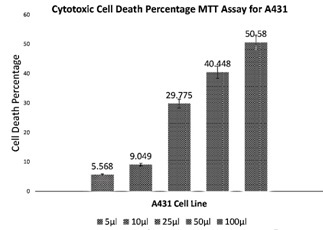 The cytotoxicity effect was observed as 5.568%, 9.049%, 29.775%, 40.448% and 50.58% in A431 cell line and 12.474%, 22.362%, 32.739%, 45.073% and 53.424% in Hep-G2 cell line for the respective concentration of 5, 10, 25, 50 and 100 µg/ml sample Table 4. GI50 value for anti-cancer activity of six non-reported bioactive compounds was understood by using the 3D-PRISM software to draw one way ANOVA non-linear line regression curve n = 5, (p < 0.05). GI50 of 14.821 µg/ml in A431 cell line and 36.578 µg/ml in Hep-G2 cell line was determined as shown in Graph 3 and 4. DISCUSSION: The preliminary phytochemical screening of G. superba tubers and A. amara leaves revealed bioactive rich compounds like alkaloids, flavonoids, phenols, saponins and glycosides. Therapeutic effects of the bioactives include prevention of cardiovascular diseases and anti-inflammatory, antimicrobial, and anticancer activity. The screened bio actives also known as primary antioxidants compounds, which has the ability to protect against the damage caused by oxidative stress induced by free radical 28. DPPH scavenging activity was performed as it is a widely used to measure the antioxidant property of the extracts. In radical scavenging activity, the maximum inhibition occurs in the ethanolic extract of both the plants as the ethanol absorbs the large amount of phytochemicals during extraction process. Thus we understand G. superba tubers and A. amara leaves have a good potential of antioxidant property 29, 30. The DPPH scavenging activity is visualized as the purple solution turns yellow, the antioxidant compounds from the plants extract reacts with unstable scavenging DPPH by donating extra electron to stabilize the medium. The stabilization causes the yellow colour indication shown in Fig. 3. The GET and AET has reliable multiple bioactive compounds which is crucial to analyze for cancer preventing agent. Antioxidant is a precursor to prevent cancers and heart disease, compounds with good antioxidant can be used for GC-MS analysis. The result of GC-MS analysis reveals the presence of many bioactive components, these ample of compounds were studied precisely in various researches and the biological activities of those compounds were recorded in library. Recorded actives of compounds provides their potentiality to prevent proliferation of cancer cell line by apoptosis, but some compounds were not yet tested and holds no record. 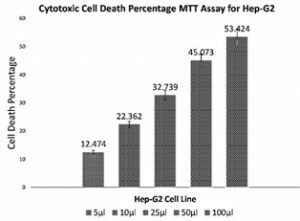 Compounds with no report were chosen for anti-proliferative analysis of A431 skin cancer SCC cell line and Hep-G2 hepatic carcinoma cell line by MTT assay. On analyzing the GC-MS result, we could able to collect the six bioactive compounds in particular retention time obtained from TIC chromatogram Fig. 4. MTT assay involves 24 well plate in which cancer cell line were cultivated and supplied with the six bioactive compounds shows cytotoxic activity against both cell lines. Bioactive compounds can be a novel product for apoptotic mechanism by stimulating cancer cell signalling pathways, this study doesn’t provides any signalling results, but yet it proves an isolated compound can provides us an anti-proliferative agent for cancer treatment 31. Isolated compounds from G. superba tubers and A. amara leaves are identified and described as compound C1, C2, C3, C4, C5, C6 in Fig. 4. 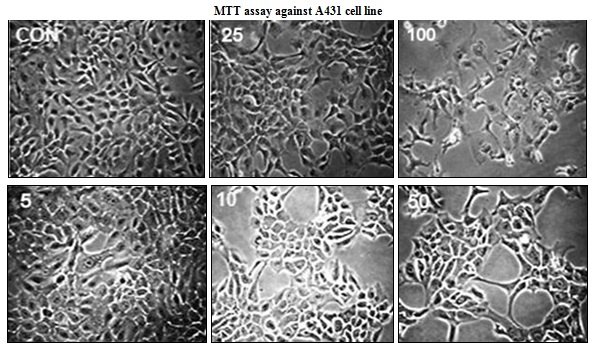 A431 and Hep-G2 cell lines lead apoptotic death visualized under microscopic view. Cell death was reported as the cells fails to retain it growth in media. Further studies can be assisted in cancer cell signaling pathways which provide dynamics of drug mechanism in apoptosis of hepatic carcinoma and squamous skin carcinoma cells. CONCLUSION: According to ethno-pharmacological records, the ethanolic extract of G. superba tubers and A. amara leaves showed antioxidant property which can prevent the cancer by stabilizing the cells. Six isolated non-reported compounds such as 3-Hydroxy-4-methoxymandelic acid, 2H-1-Benzopyran, 3, 5, 6, 8 tetrahydro, β-Amyrin trimethylsilyl ether, 3- Hydroxy- 4-methoxymandelic acid Undecane, 2, 8- dimethyl, Octadecanoic acid and 2-oxo methyl ester obtained from G. superba tubers and A. amara leaves possess anticancer property on Hep-G2 and A431 cell lines. Thus G. superba and A. amara can provide an alternative drug to treat the cancer as it has the potentiality to suppress the cancer cell growth. ACKNOWLEDGEMENT: We would like to express our special thanks of gratitude to people who helped us and to Dr. Suresh M. Pharm., Ph.D Greens Med laboratory, India; for allowing us to pursue our cancer research. CONFLICTS OF INTEREST: No competing financial interests exist. Visvader JE and Lindeman GJ: Cancer stem cells in solid tumours: accumulating evidence and unresolved questions. Nat Rev Cancer 2008; 8: 755–68. Langeveld NE, Stam H and Grootenhuis MA: Quality of life in young adult survivors of childhood cancer. Support Care Cancer 2002; 10(8): 579–600. Mariotto AB, Rowland JH, Yabroff KR et al. : Long-term survivors of childhood cancers in the United States. Cancer Epidemiol Biomarkers Prev. 2009; 18(4): 1033–1040. Anand P, Kunnumakara AB, Sundaram C, Harikumar KB, Tharakan ST, Lai OS and Aggarwal BB: Cancer is a Preventable Disease that Requires Major Lifestyle Changes. Pharmaceutical Research 2008; 25(9): 2097–2116. Michael RS, Peter JC and Futreal PA: The cancer genome. Nature 2009; 458: 719-724. Tulin E, Mehmet O and Cetin-Atalay R: Molecular Biology of Liver Cancer. Reviews in Cell Biology and Molecular Medicine 2015; 1: 206–243. Simoes MC, Sousa JJ and Pais AA: Skin cancer and new treatment perspectives: a review. Cancer Lett 2015; 357(1): 8-42. Darvesh AS, Aggarwal BB and Bishayee A: Curcumin and liver cancer: a review. Curr Pharm Biotechnol 2012; 13(1): 218-28. Greenwell M and Rahman PKSM: Medicinal Plants: Their Use in Anticancer Treatment. International journal of phar-maceutical sciences and research 2015; 6(10): 4103-4112. Lisa H: Golden age of melanoma therapy. Nature Reviews Clinical Oncology 2015; 12: 1. Shigekazu N and Masato T: Programmed cell death and immune system. Nature Reviews Immunology 2017; 17: 333–340. Susan E: Apoptosis: A Review of Programmed Cell Death. Toxicologic Pathology 2007; 35(4): 495–516. Zhao H: Extrinsic and Intrinsic Apoptosis Signal Pathway Review, Apoptosis and Medicine, Dr. Tobias Ntuli (Ed. ), In Tech 2012. Padmapriya S, Rajamani K, Sathiyamurthy VA: Glory Lily (Gloriosa superba) - A Review. International Journal of Current Pharmaceutical Review and Research 2015; 7(1): 43-49. Kumar SK and Sagar VG: Phytochemical and pharmacological evaluation of Gloriosa superba. Journal of Drug Delivery and Therapeutics 2015; 5(4): 27-42. Kokila K, Priyadharshini SD and Sujatha V: Phytopharmacological Properties of Albizia Species: A Review. Int J Pharm Pharm Sci 2013; 5(3): 70-73. Thippeswamy S, Mohana DC, Abhishek RU and Manjunath K: Inhibitory effect of alkaloids of Albizia amara and Albizia saman on growth and fumonisin B1 production by Fusarium verticillioides. International Food Research Journal 2015; 21(3): 947-952. Devi NN and Femina W: GC-MS analysis of Gloriosa superba medicinal plant of Tamilnadu. Journal of Pharmacy Research 2012; 5(1): 343. Elisha S, Michal L, Sarah S, Helena P, Elaine S and Lorberboum-Galski H: Evaluating Medicinal Plants for Anticancer Activity. The Scientific World Journal 2014; 721402: 12. Hosseini A and Ghorbani A: Cancer therapy with phytochemicals: evidence from clinical studies. Avicenna Journal of Phytomedicine 2015; 5(2): 84–97. Khalil DN, Smith EL, Brentjens RJ and Wolchok JD: The future of cancer treatment: immunomodulation, CARs and combination immunotherapy. Nature Reviews Clinical Oncology 2016; 13: 273–290. 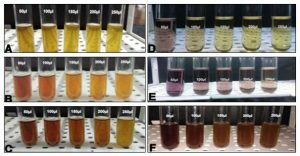 Tiwari P, Kumar B, Kaur M, Kaur G and Kaur H: Phytochemical screening and Extraction: A Review. Internationale Pharmaceutica Sciencia 2011; 1(1): 98-106. Al-Rimawi F, Rishmawi S, Ariqat SH, Khalid MF, Warad I and Salah Z: Anticancer Activity, Antioxidant Activity, and Phenolic and Flavonoids Content of Wild Tragopogon porrifolius Plant Extracts. Evidence - Based Complementary and Alternative Medicine 2016. Ezhilan BP and Neelamegam R: GC-MS analysis of phytocomponents in the ethanol extract of Polygonum chinense Pharmacognosy Research 2012; 4(1): 11-14. Mosmann T: Rapid Colorimetric assay for cellular growth and survival: application to proliferation and cytotoxicity assays. J Immunol Methods 1983; 65: 55-63. 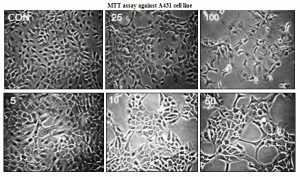 Sathishkumar J, Manoharan MS and Illanchezian S: In-vitro Antimicrobial and Antitumor Activities of Stevia Rebaudiana (Asteraceae) Leaf Extracts. Tropical Journal of Pharmaceutical Research, December 2008; 7(4): 1143-1149. Mariappan SK: Phytochemical Screening of Gloriosa superba from different geographical positions. International Journal of Scientific and Research Publications 2013; 3(1): 1-5. 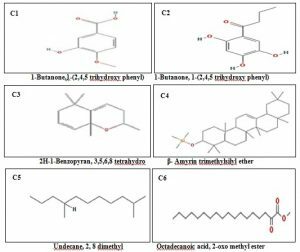 Sudarmani G: Identification of bioactive constituents of Albizia amara using FT-IR, HPTLC and GC-MS. International Journal of Chemical and Pharmaceutical Analysis 2016; 3: 1. Manoharan S: "Antibacterial activity of 50 medicinal plants used in folk medicine." Int. J. of Biosciences 2013; 3(4): 104-121. Saikat S et al. : "Free radicals, antioxidants, diseases and phytomedicines: Current status and future prospect." International Journal of Pharmaceutical Sciences Review and Research 2010; 3(1): 91-100. Hillegass JM, Shukla A, Lathrop SA, MacPherson MB, Fukagawa NK and Mossman BT: Assessing nanotoxicity in cells in vitro. Wiley interdisciplinary reviews Nanomedicine and nanobiotechnology 2010; 2(3): 219-31. doi:10.1002/wnan.54. Jayakumar FA, Simon SE, Wei YY and Woon YP: Characteristic and optimized use of bioactive compounds from Gloriosa superba and Albizia amara with apoptotic effect on hepatic and squamous skin carcinoma. Int J Pharm Sci Res 2018; 9(5): 1769-78.doi: 10.13040/ IJPSR.0975-8232. 9(5):1769-78.